Robbie and Jennifer Ray with their twins Evren and Elijah at Christmas 2017. Photo provided by family. One doctor says that the ONLY way a child’s injuries could happen is by “brute force.” Other doctors can look at the same data and say that that the injuries could have been caused by an accident, metabolic disorder, nutritional deficiency, infection, or other non-abusive mechanism. When these two perspectives collide, then justice demands that we examine other evidence. Is there a history of violence? Is there other evidence of abuse? Has anyone witnessed abuse? What about the perspective of those who know the accused – is abuse consistent with the character of the person who is accused? All too often, parents lose their children to Child Protective Services, often permanently, and others have gone to prison based on the testimony of one particular kind of doctor – a Child Abuse Pediatrician (CAP) – even though there is no other evidence that the parents have abused their child. If there is no evidence to prove physical abuse, then you need to second guess the diagnosis [made by the child abuse doctor]. CAPs present themselves to the public and to the courts that they are “THE experts” on all things child abuse related. Yet there are other doctors, many of whom are highly esteemed experts in their respective fields who dispute the findings and conclusions of the CAPs. The Ray family story is yet another example of a story repeated all across the United States and across the ocean in the UK, Australia, and other nations – that of parents accused of abuse based on the interpretation of one kind of doctor, a Child Abuse Pediatrician, without any other evidence that indicates that they abused their child. Family and friends who know them best have written letters affirming that they know the parents to be caring people incapable of hurting anyone. While there is no history of violence, there is family history of medical conditions that can cause fragile bones. How is it that we have given the power of judge, jury, and executioner to one kind of doctor, even when other doctors disagree with them? How is it that law enforcement investigators, social workers, and some other doctors stop investigating further the moment that a CAP declares “child abuse”? 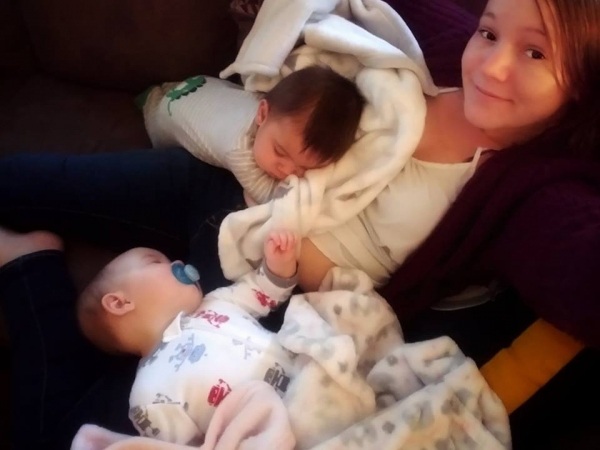 Jennifer Ray describes her pregnancy with twins Evren and Elijah Ray as “great.” She took a lot of Tums for heartburn, but otherwise she enjoyed being pregnant. When the babies’ growth slowed down during the last weeks of pregnancy and Jennifer developed pre-eclampsia, doctors decided that it was time for the babies to be born at 36 1/2 weeks. They arrived on May 9, 2017, via c-section. They were pulled out of the womb by their ankles. They spent just 6 hours in the NICU after birth, but both babies were jaundiced. They were sent home with bili lights to help bring down the high bilirubin levels. Over the course of the next couple of weeks, the babies had blood drawn from their heels more than 20 times as their levels were monitored. The last heel stick test was at the 2-week doctor visit on Wednesday, May 24. The babies got all of the routine vaccines that day. Jennifer Ray with her twins Evren and Elijah. Photo provided by family. Both Jennifer and Robbie Ray come from large families, and the Memorial Day weekend was a time for the extended family to celebrate and enjoy the new babies who were now 2 1/2 weeks old. Evren was “fussier than usual” through the long weekend, but they assumed that it was colic and tried treating her with gripe water. It was Tuesday morning, May 30, that Jennifer noticed that her daughter Evren’s ankle looked swollen. As she looked closer, she found a bruise. Jennifer called her husband at work and her mother who lived down the street. Her next call was to the pediatrician, who told her to come in at 4:30 that afternoon. The pediatrician sent Jennifer over to the nearby hospital, Palmetto Health Children’s Hospital, for x-rays. Her mother was with her, and her husband met them at the hospital. It was there that the Ray family’s lives turned upside down. An x-ray revealed that Evren’s right ankle was fractured. 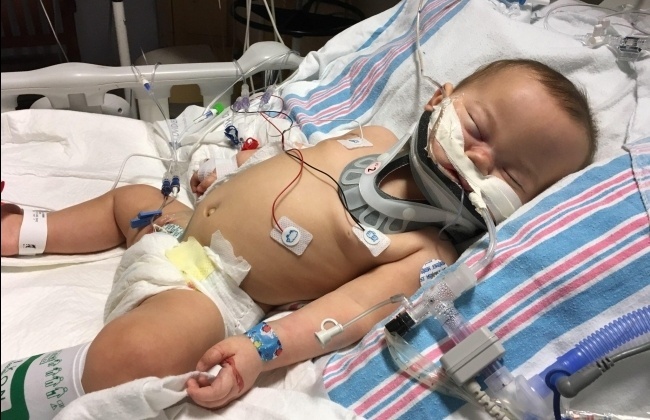 As the stunned parents tried to figure out how their baby’s ankle could have been broken, the hospital’s Child Abuse Pediatrician Dr. Susan Lamb had already been consulted. Dr. Susan Lamb – Child Abuse Pediatrician at Palmetto Health Children’s Hospital. Photo source. The Rays had no explanation. They didn’t know how the injury happened. While they were being interrogated by the Child Abuse Pediatrician, they were asking questions themselves, trying to figure out what could have happened. She also told them that it appeared that there was a fracture on baby Elijah’s ankle as well, along with 2 bruises on his back. The “bruises” were tiny red marks on his back first noted by Dr. Lamb, who said that the bruises were caused by “blunt force trauma.” Jennifer said that no one in her family had seen the bruises, and they could well have happened in the hospital as he was being handled by the doctors. He had never shown any symptoms of injury whatsoever and had always been a happy baby. 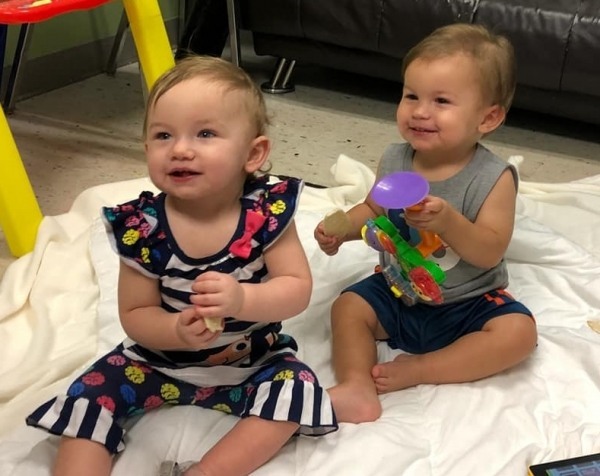 South Carolina Department of Social Services (DSS) and law enforcement were called, and both babies were admitted to the hospital that night. One investigator reportedly told the parents that she didn’t see any signs of abuse and allowed them to stay with their babies that night. Their WHOLE case relies on the testimony from that one “child abuse specialist” who said the ONLY way their injuries could have happened were from child abuse. The family’s attorney was later able to get the twins placed with an aunt. Meanwhile, the family sought answers. One doctor told them that Evren’s fracture was a hairline fracture that should heal within a couple of weeks. Another doctor told them that they couldn’t find Elijah’s “fracture” on the x-ray. Jennifer asked DSS to test the babies’ Vitamin D levels. When the social worker asked Dr. Lamb about testing, she reportedly replied that there was no way that they had rickets. This is not surprising. Since the 1940s, pediatric radiologists and, later, Child Abuse Pediatricians have made it clear in their papers that they do not take infantile rickets, or any other medical explanation for bone fragility, seriously. Soon after, Jennifer requested that the follow-up orthopedic doctor consider the possibility of Ehlers-Danlos Syndrome and have their Vitamin D levels checked. Dr. Whitaker contacted Dr. Lamb, who told him that it was not possible for Ehlers-Danlos to have caused the fractures. Dr. Lamb’s perspective is consistent with that of other Child Abuse Pediatricians, but there are studies from other doctors that indicate otherwise. These are doctors without a vested interest in finding abuse, whether or not it truly exists. In September of 2017, the Rays flew to Boston to see Dr. Holick. Both parents were diagnosed with Ehlers-Danlos Syndrome, hypermobility type 3. There is also family history that indicates that there are other family members with this inherited disorder. Both Jennifer and Evren have the classic EDS sign of blue sclerae in their eyes. Other symptoms in the twins include gastroparesis, which is often misdiagnosed as reflux, transparent mottled skin, profuse sweating, joint clicking, and skin flushing. Despite his findings, Dr. Holick’s report was never brought up in the Rays’ court case. Did Heel Sticks Cause Fracture? The explanation for what happened to the twins may well be something much simpler and less controversial. 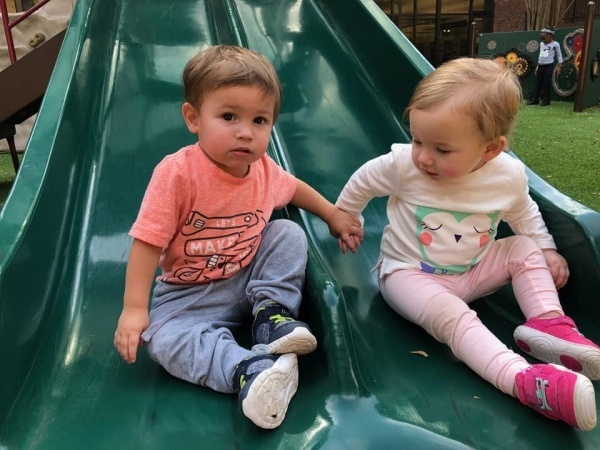 At the babies’ follow-up orthopedic appointment in September, Dr. Christopher Hydorn reportedly told the family that the injuries could have happened from the numerous blood draws from their heels. The heel stick procedure can be rough, especially if the practitioner is having a difficult time getting a blood sample. Photo source. A family friend who is also a long-time OB nurse has known Jennifer for more than 15 years. She wrote a letter to the court on the Ray family’s behalf, speaking of how kind and loving that Jennifer has always been to children, the elderly, and to animals. When I was told of the case DSS filed I was dumfounded. At NO time did the thought cross my mind that there was any merit to the accusations. I myself have squeezed and bent little feet to get the blood, hating the pressure I was inflicting but knowing the potential brain damage from a very high bilirubin was a far greater risk than a bruise or even hairline fracture. These children are being robbed of their loving home and family unit, these parents are being robbed of 1st everythings. Evren and Eli may not remember this time spent apart. Jen and Robbie will never forget. Dr. Lamb later testified that one cannot look at bruising and tell how old the bruises are. Another doctor told Jennifer that Evren’s fractures on the x-ray appeared to be healing and could be a week and a half to two weeks old. The twins’ Guardian ad Litem told the parents that she believed that the injuries likely happened during the heel sticks. Dr. Lamb testified in the Child Protective Services hearing on the morning of December 4, 2017. When court resumed after lunch, the parents were asked to make a deal to reunify. Witnesses on behalf of the parents never testified. The parents were required to complete assessments with a DSS-approved counselor to determine their risk of abusing their children. Both passed with flying colors. 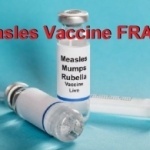 Their only diagnosis was Acute Stress Disorder from having their children taken from them. Reunification would begin with unsupervised weekend visits after DSS received the results of the assessments. Evren and Elijah had been gone since they were 3 weeks old. They were now almost 8 months old. Jennifer and Robbie had never really had the chance to be parents to their children. The first unsupervised visit began on Christmas Eve. The next was New Year’s weekend. The holidays were filled with visits from relatives who were excited that the twins were finally transitioning home. We were blessed to ring in the New Year as a family again. Robbie and I sat with the kids in our laps and cried happy and sad tears with our children when the ball dropped. New Year’s Eve Evren said her first word which was “Da-Da.” We were slated to bring the kids home officially on February 7th. Their first opportunity to finally act somewhat like a “normal” family was the following weekend. Evren is normally the more outgoing and independent of the twins, but that day she didn’t seem to feel well on that Saturday, January 6. Since several extended family members had experienced colds, Jennifer says that they wondered if she was coming down with a cold. When the babies went down for their naps, Jennifer headed to the store to get a few things while Robbie watched them. When the babies woke up from their nap, Robbie fixed their bottles. Elijah liked to be held and loved on when he took his bottle, but Evren liked to hold her own bottle. Robbie put Evren in her Snugapuppy swing and gave her the bottle. He didn’t realize till later that he didn’t buckle her in completely. One leg was not strapped in. Robbie sat on the couch and began feeding Elijah. A few minutes later, he heard a “thud,” then saw Evren lying the carpet with her face on the metal bar of the swing. He set Elijah down on the floor and rolled his unresponsive daughter over. He could see immediately that it was bad and he called 911. In retrospect, the Rays believe that she must have dropped her bottle, tried to go after it, and fell out of the swing. Shortly after the paramedics got her into the ambulance, Robbie heard her crying. A paramedic told the terrified father that her cries were a good sign and that she was coming around. …he was sobbing in panic when he answered the phone and was extremely upset trying to tell me what had happened and that he was so sorry for not strapping her in all the way. She rode with her mother to the hospital. A relative had picked up Elijah from the house. Other family members gathered at the hospital. Evren’s right eye was swollen and she had a red line across her nose. She was intubated, and x-rays showed that her right femur was broken near the hip. There was subdural hemorrhaging (brain bleeding) as well. Evren in the hospital after falling out of the swing. Photo provided by family. When Dr. Lamb arrived, she examined [Evren] and after looking at her, she provided that the injuries she observed were not consistent with the report of [Evren] falling out of a swing. Subdural hemorrhage is, according to Child Abuse Pediatricians, indicative of Shaken Baby Syndrome, or Abusive Head Trauma as CAPs prefer to call it. The CT scan done at 5:55 pm that day didn’t show bilateral hemorrhaging, but rather found that “there is a small right sided subdural hematoma,” which the Rays believe would be consistent with their daughters fall from the swing. Dr. Lamb said that there were bruises on the baby’s ears and that there were “multiple planes” of injuries that she said were inconsistent with the father’s explanation. This earlier photo shows Evren in her swing at her aunt’s house with the point of impact marked. 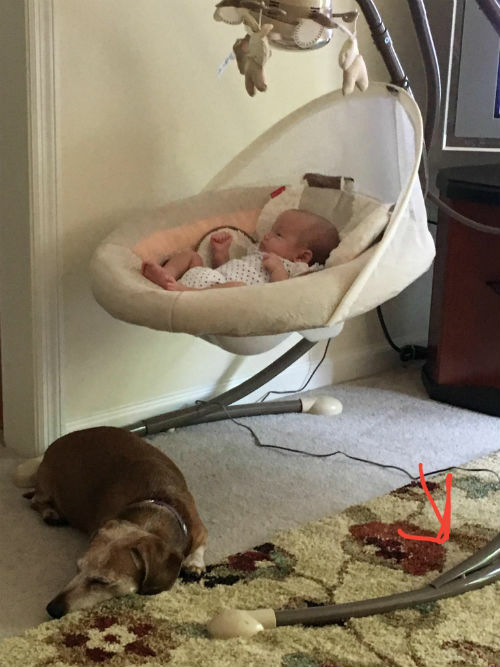 Note that one of the bars is slightly higher than the other bar that it connects to on the base, which could account for injuries on “multiple planes.” Photo supplied by family. A tightly-held doctrine asserted by Child Abuse Pediatricians is that the symptoms of Abusive Head Trauma cannot arise from short falls. Other doctors refute this assertion. There are case studies and other medical articles showing that short falls can indeed cause serious injury and even death, such as a 2001 study published in The American Journal of Forensic Medicine and Pathology (Source). …clinically, short falls have been documented to cause serious injury. (Source). At one point, Dr. Lamb told the Rays that the leg fracture was 2 weeks old, even though none of the relatives’ accounts indicate any sign of injury before she fell. Some family members had been at the Ray home only hours before the accident, but the only complaint anyone noted was that she didn’t seem to feel well, as if she were coming down with a cold. Medical professionals [i.e. 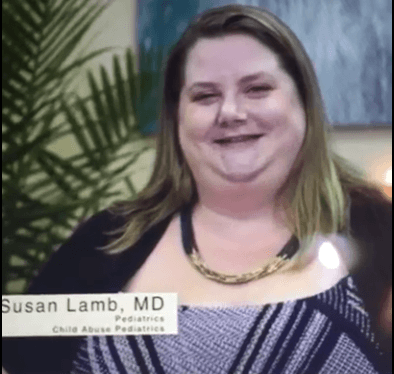 Dr. Susan Lamb – Child Abuse Pediatrician] said the child’s injuries are consistent with abuse, and inconsistent with the account provided by Ray. While Evren was in the hospital, she developed a high fever and showed a high white blood cell count. She was treated with multiple antibiotics for a urinary tract infection, e-coli, and MRSA. A brain scan also later showed an infarction, or an area of brain tissue death, according to Dr. Lamb’s final report. 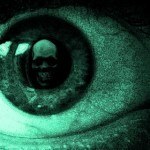 Medical records show that there was no infarction in the CT scan that was performed on the first day. Evren and Elijah Ray playing with their family at a visit several months after Evren’s accident. She is “doing great.” She still has some weakness but she has recovered excellently, according to her family. Photo provided by family. The family believes that there was more going on in the hospital with their daughter, but there are conflicting medical reports. They don’t have clear answers, and they still don’t know if their children have an underlying metabolic condition. They don’t know how they got an infection or why doctors inserted a “central line” into Evren’s femoral artery. They know that they themselves have been diagnosed with Ehlers-Danlos Syndrome, and that their children are more likely to have it because they do. Child Protective Services seized custody of both babies and placed them in foster care, this time with strangers. There was a period of time that the twins were even separated from each other. 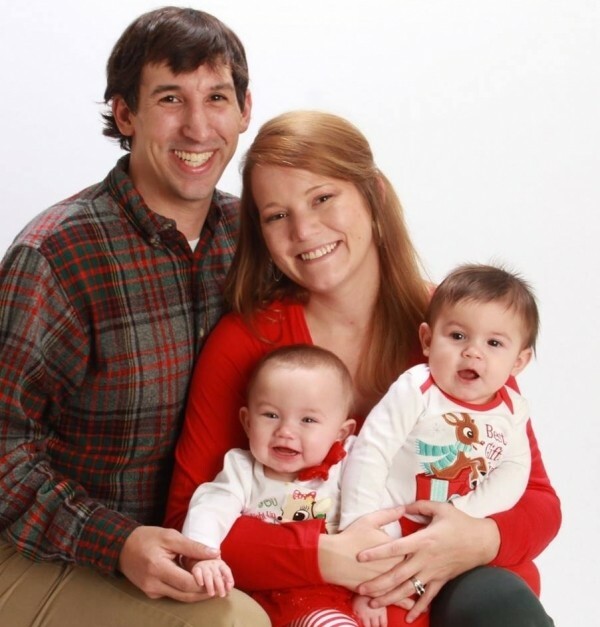 Social workers explained that they didn’t want any relatives to have the babies, because then Jennifer and Robbie might have “access” to their children. Jennifer wasn’t even home when the accident occurred, but DSS wants to terminate her parental rights as well as Robbie’s. The DSS goal is now to adopt them out. Evern [sic] Ray is brain dead on the right side of her brain. Dr. Susan Lamb stated that the child may not live, due to the extent of her injuries. Elijah and Evren seem to be doing well. This photo was taken at a visit on October 16, 2018. Supplied by family. The common thread in many medical kidnap stories is a Child Abuse Pediatrician. Parents lose their children, and some go to prison, and the only “evidence” that they abused their children is the interpretation of a Child Abuse Pediatrician. That interpretation is the lens through which social workers, law enforcement, and judges view the parents and the case. Any testimony or reports of doctors who disagree with the allegation of abuse is dismissed, and evidence of the parents’ innocence is often ignored. The testimonies of the parents’ character from people who have known them their whole lives becomes irrelevant once a narrative to follow has been determined. It isn’t the medical evidence or facts that convict parents; it is the INTERPRETATION of the data that signs the family’s death warrant and tears families apart. Dr. Susan Lamb spoke about how she sees her role as a Child Abuse Pediatrician in a video that was previously on the Palmetto Health Children’s Hospital website (here), and on YouTube. It has since been taken down after the Rays posted it on social media. Jennifer Ray recorded the video before it disappeared. We just provide medical information, medical diagnoses, and help them understand. We don’t work for DSS. We don’t work for law enforcement. We’re just medical interpreters. We kind of stand at that gap between the medical world and the investigative world, and we interpret for them. It’s collecting the medical pieces and putting them together and trying to help the investigators figure out what could or could not have happened to this child. Dr. Lamb works for the Metropolitan Children’s Advocacy Center in Columbia, South Carolina. (Source). According to SC state law, the Children’s Advocacy Centers are sanctioned and funded by the state to address child abuse. (Source).